A one-page overview that decodes leadership and outlines how great leaders ACTUALLY achieve success. Discover what great leaders focus on to be successful in today’s digital age. Leadership can be a confusing web of mixed messages. Ensure you have the clarity you need to target your efforts and achieve the best results. Quickly understand what you should be doing to be successful in today’s world and the processes you need to create a high performance team. Explore and answer 10 powerful questions that will enable you to discover both your strengths, and the areas you need to work on. The world is changing fast and, as such, the rules of how we lead organisations have shifted. The sad fact is that many leaders haven’t discovered this yet and are leading in outdated ways. Many leaders are struggling, feeling too overwhelmed, busy, confused or unsure of what to do. What seemed to work before just doesn’t cut it anymore. 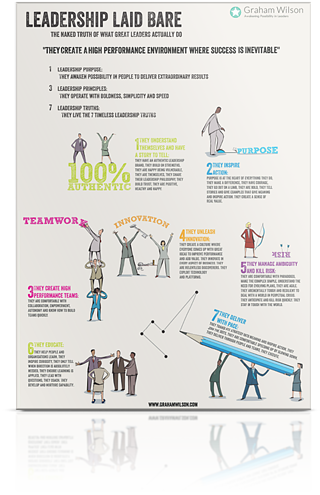 This infographic shares what we have learnt about leadership from developing over 75,000 of the world’s greatest. We have decoded what great leadership looks like to share it with you here and you can even test yourself against the best by exploring and answering 10 powerful leadership questions. Love seeing what you need to do on one page. It is really powerful, simple and effective. I have used it to guide my leadership behaviours, and it has had a massive impact on my results.